Admissions accepted 24 hours a day, 7 days a week, including holidays. 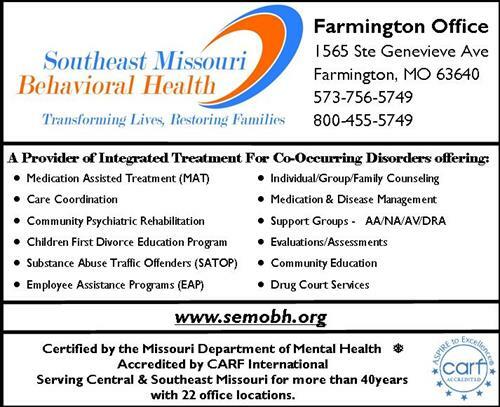 Southeast Missouri Behavioral Health is a not-for-profit human services corporation that provides mental health services, substance abuse treatment and social services. Personnel are utilized to the extent of their abilities, education and experience in realizing our goals. The Agency's own interrelationship is such that all services are coordinated and not duplicated elsewhere in our communities. Each program offered by the Agency is distinct and designed to properly fulfill its goals and objectives. Efforts are continually made to make known these services and educate as many clients as reasonably possible. Outreach, as stated, is paramount in the Agency's overall operations. Southeast Missouri Behavioral Health has been a provider of mental health and substance abuse services to people of the Southeastern Region of Missouri and beyond for over 40 years. For more than 40 years our staff has been committed to providing people suffering from chemical dependencies, emotional problems, psychiatric disorders and other crisis of life the most complete treatment services in the region. In addition, SEMO-BH has become a leader in the regional chemical dependency education and outreach network. So that we can meet the needs of those we serve, we offer a variety of services.